I officially received my first public art commission through Houston First! 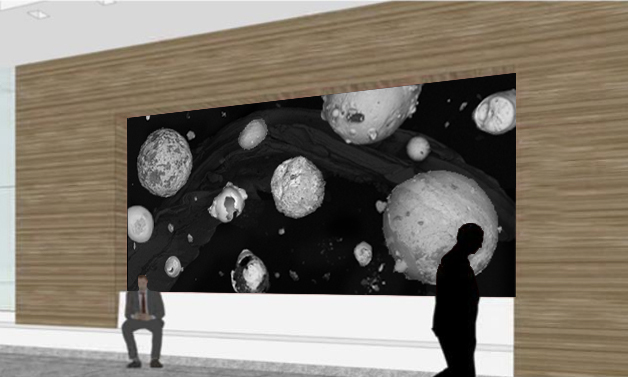 It will be permanently installed in the George R. Brown convention center this Fall! I am utilizing a scanning electron microscope to magnify and scan in small pieces of welding spatter, metal casting spatter and metal shavings. I will then arrange all the scans to look like a space scape. I titled it Metallographic Cosmos. SSGraphics are printing the piece on durable matte wallpaper and installing it when my wall is finshed. I am beyond excited to have a permanent artwork on display that will be up during the 2017 Superbowl and all subsequent events. The image below is my proposal image. The artwork will look similar, but actually on a much larger scale. I have a total of 1,400 square feet to fill!